It's starting to get warm around here; we put the AC in our window last night! That means summer's just around the corner. One of our favorite treats in the summer is to go to the waterslides. Now normally I don't put sunscreen on myself or my kids every time we go outside. I prefer to try not to be out in the heat of the day and just wear light clothing to cover up. But going to the waterslides you don't really have that option! They don't open until 10 and the hotter it is outside the more fun it is to be in the water. So, we really need a good sunscreen. Now, I'm pretty particular when it comes to sunscreens. Cory reacted badly to a sunscreen the first time he wore it when he was just a year old so I did a lot of research and finally found one that has worked for us. This means it has no fragrances, no extra ingredients, and we are limited to the mineral sunscreens. If you know me you know how important it is to me that we limit the amount and kinds of chemicals we put in and on our bodies. This sunscreen that we use on our boys is still available (although it's rather expensive), but the one that I have been using is no longer available in the formulation that the Environmental Working Group (EWG) lists with a good rating. So now I need a new one for me, too. 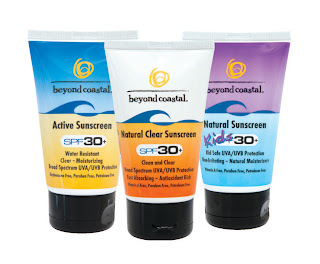 Recently I was introduced to a new sunscreen company called Beyond Coastal. They sent me a trial package of their sunscreens as well as information on the company. I was thoroughly impressed by the fact that I can read all the ingredients and actually have a clue what they might be (Vitamin E, Aloe Vera, Shea butter, etc.). None of their sunscreens have a rating higher than 3 and the Natural line all have a 2 rating (on the EWG Skin Deep Database). This makes me super confident that when I do need to put sunscreen on my kids I'm not doing more damage to their little bodies by adding yucky chemicals. When I used the Natural Kids SPF 30 I liked that for a mineral sunscreen (that's the white stuff) it actually rubbed in fairly quickly and really didn't feel greasy. Usually I have to wash my own hands after applying it, but with this sunscreen I didn't notice it was nearly as bad. And, if you absolutely can't stand the white sunscreen you can try their Active line. They use the least toxic of the UVA blocking chemicals; avobenzone, plus all the other ingredients are natural just like in the other line. Finally, all their sunscreens are fragrance free, paraben free, and even gluten free! They have a slight scent, probably due to the various oils used, but I found it to be light and pleasant. 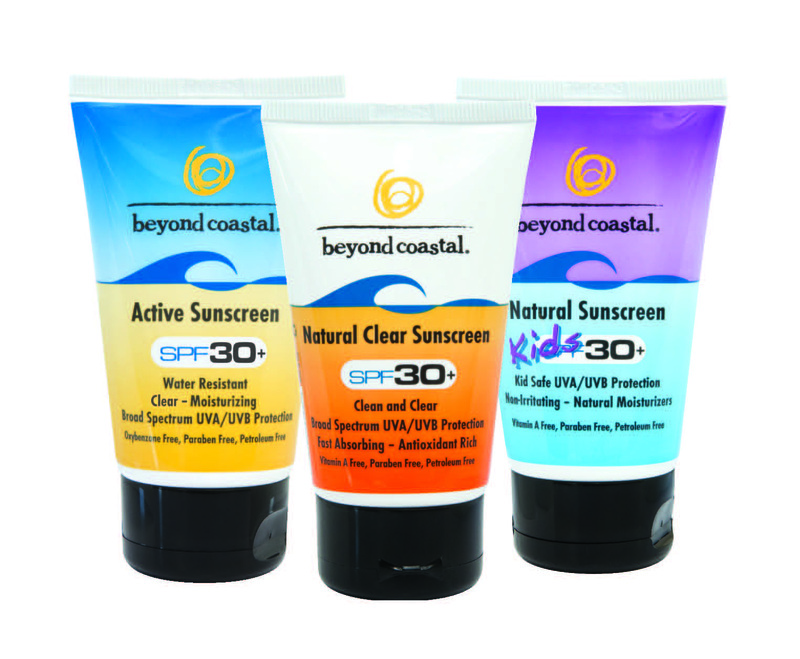 I'm happy to have a new family of sunscreens to add to our arsenal for fun summer days! If you would like to win the same sampler pack that I received all you need to do is answer this question: What does your family like to do in the sun? Leave the answer in the comments! Please be sure I have a way to contact you or I will have to choose another winner. Contest will end next Tuesday (the 22nd) at midnight, or whenever my mama brain remembers to close comments! 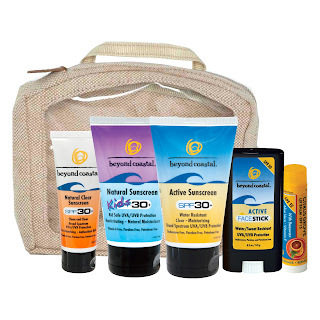 I received the sample pack of sunscreen in order to facilitate my review through the Global Influence network. All opinions are strictly my own. We love to hike,and bike and play at parks, in the water, garden, picnic...pretty much anything outside we love to do! :). Hi Krista! What funny timing, I was just taking a break from researching better sunscreen options (after getting a little bit of a burn working in the garden all day) when I saw your link from facebook. :) My kids love to play in the water, too... everything from the hose to the river, so we definitely can't avoid needing sunscreen all summer long! Wow. What don't we like to do in the sun??? I think one of the most sun intensive activities is picking berries and fruit in the summer. I have gotten some crazy sunburns over the years. It's rough having fairer skin than my kids but it is generally nice that if I put on sunscreen and start to feel the sun, then we go inside and the kids will be totally fine even if I never put anything on them! I hope I win!! We like to BE in the sun!!! That's why we come to Leavenworth to visit during the summer. John loves to play on his "Sand Mountain" (the big pile of sand in our yard), and I love to putter in the garden, or read a book in some dappled shade. I hope to do some fishing with John this summer, and maybe a little swimming. Thanks for the giveaway! We love to go boating, swim in the pool, play on the beach and on the slip and slide!! So thankful it is getting warmer! Love to go the beach! We love going to the pool and to the park! It seems like I spend forever driving people around and since I have a nursing baby, I haven't been putting sunscreen on. My left arm is quite brown at the moment! The main thing that gets us out into the sun (and HEAT!) here to play are festivals! They celebrate EVERYTHING here! There's always lots of food and music.